readers who are skilled in a number of psychic crafts. Looking for guidance on love, money, family or work? insightful psychic reading over the phone. will be professional and friendly. Your destiny is just one call away! Chat2Psychic has been established for 11 years and in that time we have grown to become one of the best providers of psychic services in the UK. 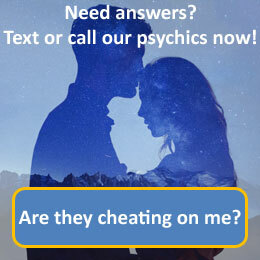 We pride ourselves on offering the services of some of the most talented psychics in the country who are available 24 hours a day to provide you with genuine and accurate readings over your phone. The most important aspect for us is to provide you with the best readings we can so we take time and care when selecting our psychic professionals. You'll find that we have over 300 readers on our network and all of them have a variety of skills and talents on offer. These will range from tarot and love tarot card readers, spiritual coaches and healers, clairvoyants, mediums, rune and angel card readers. You'll find each of our readers has a description of the skills they possess, so take time to select the right reader for you. You can also read your free daily horoscope every day on Chat2Psychic. Remember, if you use our service a lot, it's cheaper to set yourself up with a credit or debit card account - these readings work out to be just 90 pence per minute. Many of our customers come back time and time again for a reading but don't take our word for it as you can read some of their feedback comments below. We love to hear from our callers so please drop us a line any time.